The sun did not rise on D+1. Instead, the leaden sky lightened almost imperceptibly until someone decreed the smoking lamp was lit and thousands of nicotine-starved Marines added cigarette smoke to an already cloudy morning. Heavy cumulonimbus clouds hung low from horizon to horizon. It was raining, which made the air feel much colder than it really was. 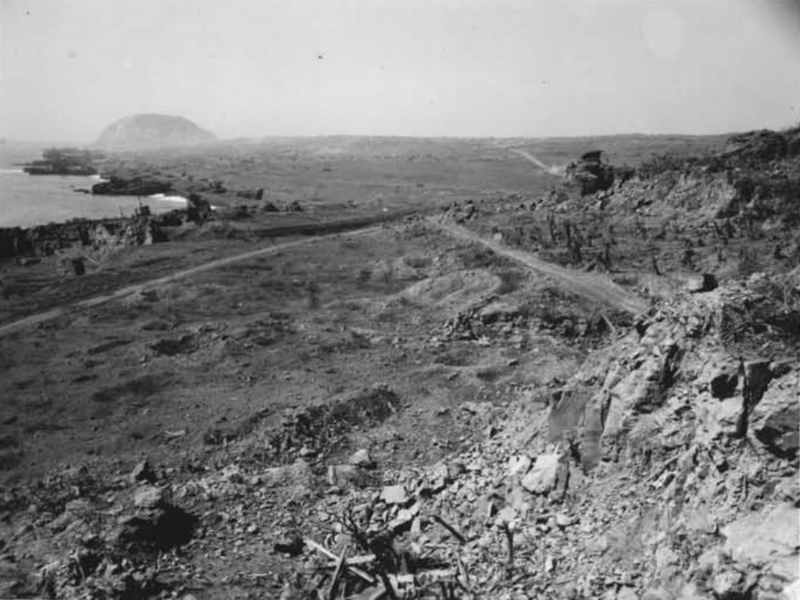 The moisture turned Iwo Jima’s volcanic ash into a gluey black sludge. It kept the lingering smoke from a pre-dawn mortar bombardment low to the ground. It kept the smell of sulfur, cordite, and blood down at foxhole level. 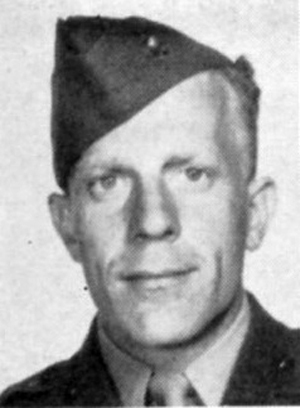 It made everyone uncomfortable, from the battalion commander in his rear-area crater, to the Baker Company men who nested in their captured blockhouse, to Corporal Bartholomew Robert John Wanagitis, “Taxi” Wanagaitis, a quiet Catholic boy from coal-mining Pennsylvania, whose curly hair and comic timing reminded his buddies of William Bendix, who fought in the Marshalls and the Marianas, who rose to command a mortar squad in Company A, and who lay dying from shrapnel wounds in his back, bits of metal that had killed or wounded his whole squad the night before. If Taxi lived to see the dawn, his last was a sullen one. Iwo Jima was socked in and seas were high. Air support, naval gunfire, and resupply by landing craft would be especially challenging. It would not be an easy day. How “Taxi” looked on leaving home, 12 October 1942. What his mother received in his place, July 1945. With daylight on “D plus 1” we soon felt the artillery, mortar, and rocket power still possessed by the Japs…. As a battalion liaison officer, it was “Fireball” Stott’s job to keep abreast of the status of his rifle companies, and connected to the appropriate supporting forces. This was familiar work for Stott, whose Navy Cross citation recorded the details of his exploits as a liaison on Saipan. From his position at the battalion CP, the captain could make numerous comparisons between his current situation and his experience in the Marianas. Most involved artillery, and none of them were favorable. “Barrages began falling on areas throughout the entire beachhead,” he wrote. “These barrages were carefully calculated, ranged, and observed, in contrast to the hit-or-miss artillery tactics often practiced by the Japs. Our holdings on Iwo presented a concentrated target subjected to battery fire which scarcely could miss. On Saipan, we received occasional salvos, but never the concentrations now dropping.” The intensity of the fire was such that in fifteen minutes, Stott counted more than 250 missiles falling in a 600-square-yard area. Occasionally, a harried runner would vault into the CP, or the inconsistent “handie-talkie” radios that linked HQ to the front line would crackle to life. The news was generally bad. “As this pounding continued, the riflemen at the front were meeting infantry and mortar opposition which made all gains meager and limited,” Stott recalled. “Protecting tanks were smacked with heavy anti-tank fire which knocked out many more than had fallen to such fire on Saipan. Unbelievable exploits transpired about these damaged tanks, as some that were overturned and caved in by explosions, still yielded up two, three, or four living crewmen.” Stott, who had nearly met a tanker’s fate on Saipan, readily sympathized with the unique dangers faced by the crews of the metal behemoths. By this point in the war, 1/24 was well familiar with tank-infantry cooperation, but Iwo’s rough terrain and shifting sand made maneuvering the vehicles difficult. Besides, they tended to draw fire. 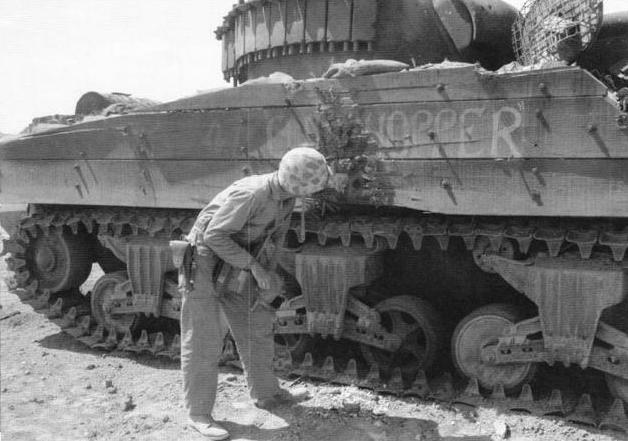 A curious Marine inspects the wound that killed M4 Sherman “Clodhopper,” of C/4th Tank Battalion. The battalion CP, probably located in a cluster of foxholes and craters, was a bustle of activity for much of the day. Demolitions men went out on missions of destruction, and most returned for additional loads of explosive or flamethrower fuel. Communicators tinkered with the fickle radios and attempted to string landlines between important positions. The intelligence men pored over maps, inspected smashed Japanese weapons in knocked-out emplacements, and collected souvenirs from the front lines. Doc Porter’s aid station treated a steady stream of casualties, most of whom were sent back to the beach where they waited under fire for a boat to brave the heavy swells and carry them to the safety of a hospital ship. In the afternoon, the main body of HQ displaced forward to a new location in TA 166 F, on the fringes of the regimental assembly area. As I looked around the beach area from my position all I could see were dead marines everywhere and not a dead Jap to be seen. The Marines couldn’t see the Japanese – but from this position, the Japanese could see Company A clearly. 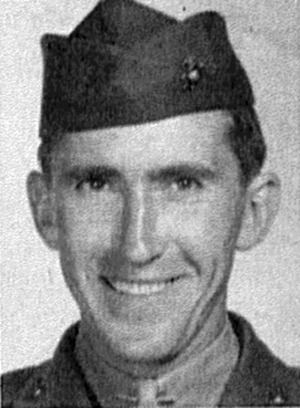 The company commanded by Kirkland Stewart – Major William K. Stewart, Citadel ’41, preferred his middle name – held the right flank of the line. Not the battalion, the regimental, or even the division line—they were the right-most American unit on Iwo Jima. This was not an unfamiliar position for “Rugged Able Company,” and those who’d manned the line on Tinian knew how it felt to have nothing to one side but the sea. There, they’d held against one of the biggest banzai attacks of the war. Here on Iwo, they’d awaited such a charge but faced none. The assignment for the day sounded simple: they would hold position and “mop up” the immediate area and the rear. The shoreline of Beach Blue 2 and the Boat Basin fell within their area of operations. A wrecked Japanese ship lies off the Boat Basin. The ground, TA 166D-E, was Able Company’s area of operations on D+1. Photographs from Iwo Jima Naval Gunfire Support. Many a new man was heartened at the news. They’d seen what the well-camouflaged and fanatically defended Japanese emplacements had wrought when they relieved the decimated 3/25 before the sickening dawn. Corporal Alva Perry described the scene well: plenty of dead Marines, no dead enemies. To the inexperienced, mopping up sounded like a breeze compared to an assault, but veterans shook their heads. This detail meant hunting down the most determined Japanese, the ones who hid quietly in caves and burned-out bunkers, or among their own dead, waiting patiently for their chance to take a Marine with them into the afterlife. It was hard and dangerous work, and Able Company paid a steep price. Preparatory fire from the USS Idaho destroyed this 47mm gun emplacement in TA 166D. However, the battleship missed this 25mm machine gun position. A squad from Able Company attacked and cleared this position themselves on D+1. Photographs from Iwo Jima Naval Gunfire Support. This terrain was a perfect proving ground for the battalion’s assault platoon, and the demolitions men were busy throughout the day. 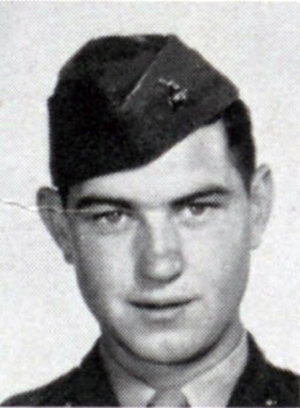 A squad of flamethrower men under Sergeant Harlan C. Jeffery joined up with a patrol led by Corporal William Loutzenhiser; the well-armed group disappeared into a ravine to investigate a suspicious position. Their fears materialized in the form of a single, talented Japanese sniper. The sudden crack of his .31 caliber Arisaka scattered the patrol and pinned Sergeant Jeffery’s squad to the ground. Able Company’s left flank fought through this area, TA 166D, on 20 February. Conditions on the right, where Sergeant Jeffery’s men were pinned, were similar in appearance. Meanwhile, Corporal Loutzenhiser’s team was trying to escape back down the draw. 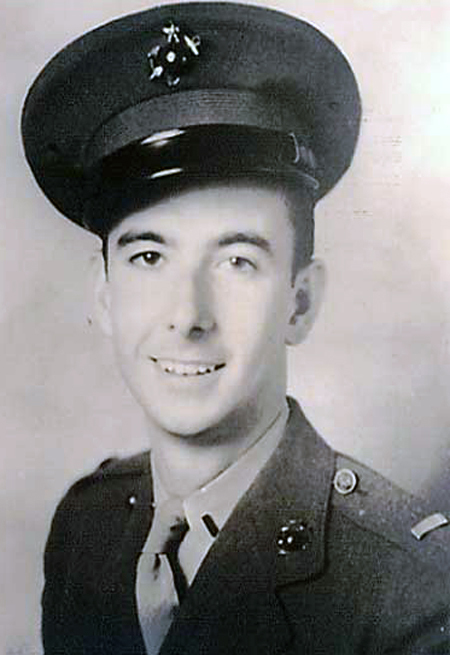 Bill Loutzenhiser himself never made it – he was killed by a rifle shot to the back – and a Japanese mortar team started laying down fire on Able Company’s position. One hit about twenty yards behind Perry’s position: instead of exploding, the shell started to hiss and leak a greenish smoke. For the new men, this smoke could mean only one thing: the Japanese were using gas. The words of their fathers, uncles, and hometown Great War veterans came back to them in a rush. Gas was the worst thing that could happen to a man. It left you blind, blistered, drowning in mucus. It left you to choke in the bottom of your hole, or to come back home with incurable skin diseases. It was to be avoided at all costs. And here they had listened to the veterans and dropped their protective masks as useless impedimenta back on the beach. As Perry watched in disbelief, “nearly everyone in the company got out of their holes and started to run for the beach where we had all dropped our gas masks. Many of these guys became targets for the snipers, and a number of them died.” Perry, a veteran of Saipan, might have identified the green smoke as picric acid, a key component in Japanese explosives. It was not gas after all, just “a bad shell.” This knowledge came far too late for far too many men. The ambush and the gas panic caused so much chaos that the company’s total advance for the day was less than 100 yards. …that covered this field of fire in TA 166D. 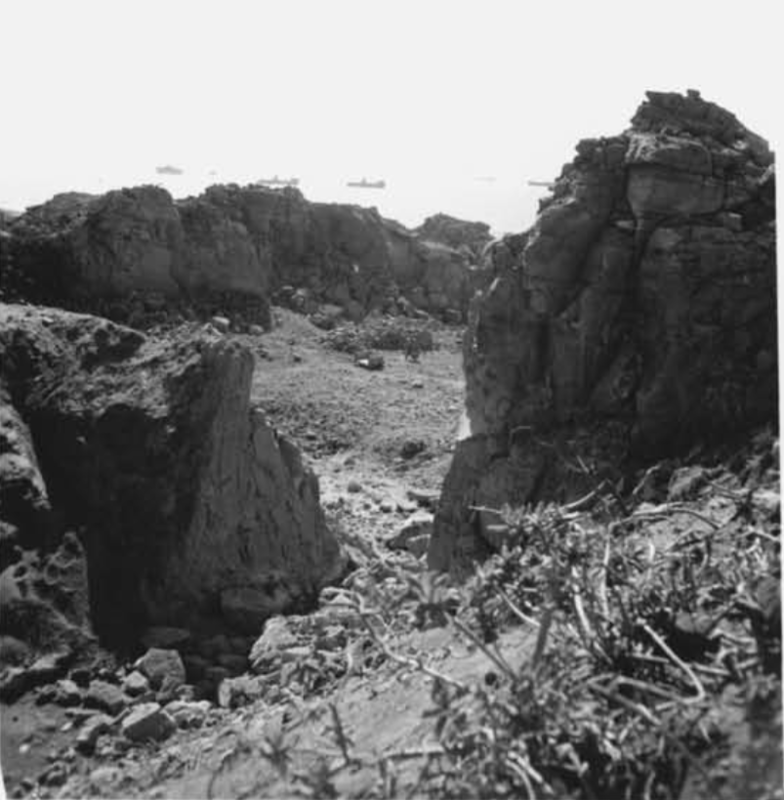 On February 20, 1945, squads from Able Company dodged Japanese fire in the exact terrain pictured above. We wanted to get beyond this point so the guys behind us could take over and play the game for a while. These blockhouses, reduced to shattered concrete and tangled rebar, were familiar sights to Baker Company by the end of D+1. Photographs from Iwo Jima Naval Gunfire Support. A few managed to get out of the bunkers, but were pinned down in Japanese trenches and shell holes. 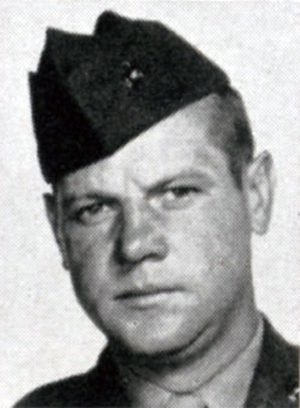 One such Marine was PFC Stanley Cupps of Tulsa, Oklahoma. “Chick” Cupps was part of a demolition squad, and felt he’d earned a brief respite after his busy morning. He rummaged in his pockets for lunch—a can of cold hash—and set the open tin on a nearby rock as he made himself comfortable, perhaps glancing up at an American fighter plane droning overhead. The pilot of the plane glanced down and saw movement on top of the ridge. Believing them to be Japanese soldiers—despite the presence of marker panels that identified friendly troops—the pilot pushed his plane over in an attack dive. His shooting could not have been better, nor could his mistake have been worse: his sights were squarely set on Baker Company. As if to prove Cupps’ point, explosions began to blossom along Baker Company’s line—and it was soon obvious that American artillery and warships were mistakenly targeting friendly positions. The entire tragedy played out in full view of the battalion aid station, which immediately began preparing for an influx of casualties. Richards Lyon winced as a blockhouse took a direct hit, and heard someone mutter, “There goes Bill Eddy and Baker Company.” The loyal surgeon shot back “Not likely! Bill’s too smart and experienced, and takes nothing for granted. He’ll take cover.” Doc Lyon was right: Captain Eddy was OK, but 25 of his men were treated for wounds on D+1. A wounded man is helped to the rear in Baker Company’s sector. Note the reinforced concrete bunker in the background, and the stenciled UNIS number “413,” indicating Company B. Man on left with rosary is a corpsman, Anthony Marquez. Official USMC photo. My duties were just those of admiring the actions of our seasoned corpsmen. I must have done something for sure, but can’t remember anything heroic, besides stopping bleeding and applying the wonderful new plywood leg splints, in place of the horrible traction devices used until then. If at times we needed more help, any [former] Boy Scout was effective. The designation “Battalion Surgeon” was impressive, but in fact it was “first aid” all of the way. While they hated to watch calamity befall brother Marines, Company C was quite pleased to be in reserve. The cynics would mutter “Semper Fi, Mac”–Marine-speak for “better you than me”–while the realists understood the direct relationship between the number of Baker Company casualties and their own chances of being fed into the front line. Charlie Company did lose a few men wounded, one of whom later died. 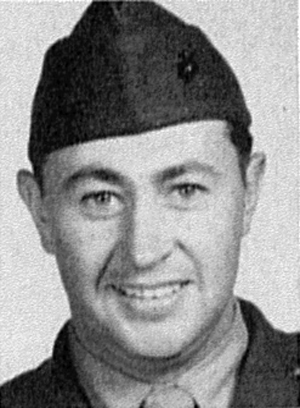 Second Lieutenant Francis P. Cabrall, Jr. would become 1/24’s first officer fatality of the battle. 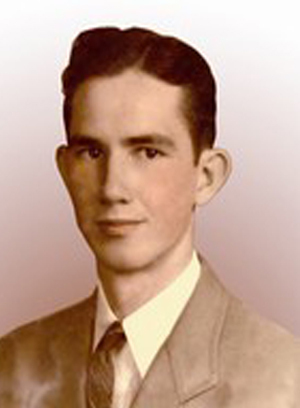 “Sonny” Cabrall turned twenty-one just one week before he was hit on Iwo. He died of his wounds on February 23. At 1700, the word came down to consolidate positions for the night. Company B remained near its blockhouses, while Company A anchored itself on the beach. The Japanese, knowing the Marines would not be moving after dark, stepped up their mortar fire as suicide-ready infiltrators said farewell to their comrades, fingered their hinomaru yosegaki, and picked up the grenades they’d use in their night’s work. They did not expect to return, and the Marines were glad to oblige them. Young “Chick” Cupps, who’d narrowly escaped death by friendly planes earlier in the day, was crouched in one of Baker Company’s bunkers. The blazing light of a flare showed a pair of Japanese legs—identified by their Japanese leggings—directly in front of him. Cupps leaned on his trigger and the enemy fell dead on his own sword. “Another Marine told me the guy was standing there with the sword over his head getting ready… I guess he was waiting for light from the flare to try to chop my head off.” Cupps kept his head, along with the bloody Japanese sword, which he mailed home to Tulsa. Daytime or nighttime, life on Iwo was already beginning to take on the characteristic and unwelcome pattern that would characterize the battle in memories and histories for decades to come. 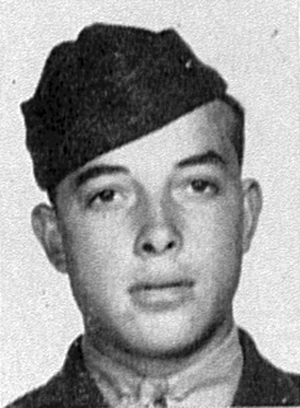 Mortar Squad Leader, A Co.
Charlie 2Lt Francis P. Cabrall, Jr. Weather report of USS Ozark. The average temperature for February 20, 1945 was 67° Fahrenheit. The assault and demolitions platoon was an experimental unit dreamed up at Camp Maui and made up entirely of volunteers. Their main weapons were 16-pound satchel charges, M2 flamethrowers, and bazookas. This platoon worked so well in combat that it became part of the regular battalion structure. The attack order called for 2/25 and 3/25 to swing to the north and east, then advance with 1/24 as three battalions abreast. As the maneuver would pivot to the right, the right-most unit (A/1/24) was to wait until the line was advanced. This took longer than expected due to heavy resistance in the 25th Marines area of operations. Lt. Col. Whitman S. Bartley, Iwo Jima: Amphibious Epic (Historical Section: Headquarters, USMC, 1954), 80. [8.1] Domenick Tutalo in Larry Smith, Iwo Jima (New York: W. W. Norton and Company, 2008), 105. 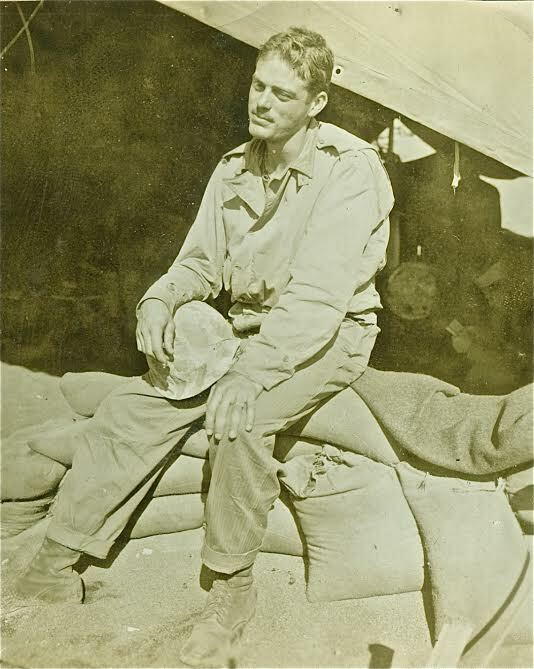 [8.3] Harlan Chester Jeffery, unpublished diary entry dated 20 February 1945, collection of Domenick P. Tutalo. On Saipan, many Marines noted that Japanese shell bursts emitted greenish smoke. There were several panics, particularly when an enemy ammo dump went up, until the source of the smoke was explained. While picric acid fumes are themselves toxic, this was not a deliberate attempt to introduce chemical warfare. [10.1] Tommy Lynchard, telephone interview conducted by the author, summer 2015. John C. Pope, Angel On My Shoulder, Kindle edition, location 1491. 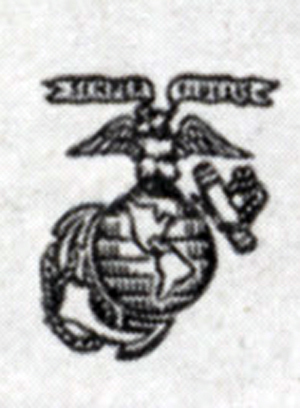 [12.1] Bill Crozier and Steve Schild, “Uncommon Valor: Three Winona Marines at Iwo Jima,” Winona Post, 25 October 2006. Online edition. Final Report, 148. The AAR is careful to note that “This unit did not call for this mission,” while praising the work of their own Air Liaison officer. 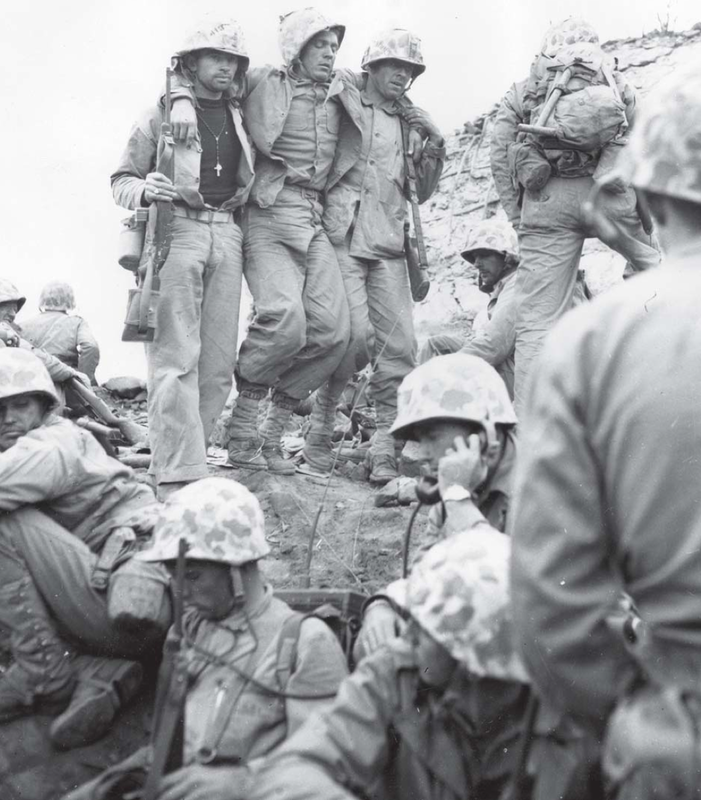 “The battalion suffered five killed and six wounded as a result of this misguided effort.” Bartley, Iwo Jima, 82. Friendly-fire casualties are generally recorded as being simply “wounded in action,” making it difficult to identify individuals. This author has only identified one, Private William Lazzareschi, who was hit in the leg by a .50 caliber bullet. David Harper, “Month in Hell Lingers in Memory,” Tulsa World, 19 February, 1995. Accessed 15 February, 2015. [17.1] Glenn Buzzard in Larry Smith, Iwo Jima (New York: W. W. Norton and Company, 2008), 87. Charles Brown and Alfred Eskildsen, oral history interview conducted by Ed Sutkowski, “Interesting People with Ed Sutkowski, Episode #404 – Chuck Brown and Al Eskildsen,” February 26, 2009.